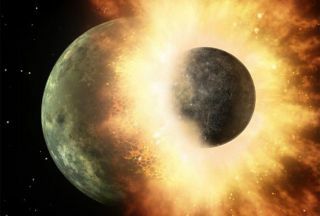 This artist's conception of a planetary smashup whose debris was spotted by NASA's Spitzer Space Telescope in 2009 gives an impression of the carnage that would have been caused when a similar impact created Earth's moon. The moon came into existence after several planet-size space bodies smashed into the nascent Earth one after the other, with the final one actually forming our satellite, while several impacts repeatedly blew off our planet’s atmosphere, according to a new study. Until now, scientists thought it was unlikely that the early Earth could lose its atmosphere because of a giant moon-forming impact. But the new research, based on recent studies showing that at its infancy our planet had magma oceans and was spinning so rapidly that a day was only two or three hours long, argues that this may have been possible. Stewart presented her idea, developed along with Harvard colleagues Sujoy Mukhopadhyay, Simon Lock and Jonathan Tucker, at a Royal Society conference in London on the origin of the moon. The study will be published in the journal Philosophical Transactions of the Royal Society. The teambased the research on two recent studies, one of which Stewart conducted with Matija Cuk of the SETI (Search for Extraterrestrial Intelligence) Institute in Mountain View, Calif., in 2012. That research argued that the moon is actually a giant merger of bits and pieces of our own planet, partially destroyed by a catastrophic collision with a space body 4.5 billion years ago. This ultra-rapid spin is one of the important conditions necessary to make the atmospheric loss theory work, Stewart said. The other criterion is the presence of terrestrial magma oceans — and this hypothesis has now got support thanks to new data obtained from volcanoes. Tucker and Mukhopadhyay, who presented their work at the 44th Lunar and Planetary Science Conference in March, sampled elements from volcanoes in Iceland, which have rocks that are among the oldest on Earth and thus retain the geochemical signatures of the Earth's so-called lower-most mantle, closestto the planet’s core. They also looked at elements found in volcanoes that sample the upper mantle, such as mid-ocean ridge basalts at the bottom of the Atlantic. They found that elements in the deep mantle that retain a very ancient chemistry, from the times of the Earth's formation, are very different from those in the upper mantle we see today. In particular, the presence of two noble gases, helium and neon, is very different today from what it used to be, Stewart said. Both these gases are very rare on today's Earth, but they are found in the solar system in abundance. And as "documented" by the deep Earth, when our planet was just forming it contained much more helium and neon as well. "The implication is that [the lower-most mantle] hasn’t been completely overprinted by subsequent evolution, and it’s helping us pinpoint events that had to happen to lead to the planet we see today," Stewart said. So how and why did these gases disappear? While helium is not gravitationally bound to the Earth, neon is, and it needs a powerful "kick" to escape. "For such a dramatic change to happen, you can’t do that with just open loss off the top — instead, you need to eject the whole atmosphere in a catastrophic type of event, a giant impact," Stewart said. Besides atmospheric loss caused by impacts that melt all rock to create magma oceans, to get to the present-day neon-to-helium ratio Earth would have to suffer multiple impacts. In other words, the Earth probably lost its primordial atmosphere multiple times, and the magma oceans were melting more than once. The final impact, Stewart says, led to the creation of the moon, and resulted in the ratio of the gases we have today. "One single impact is not sufficient, there had to be at least two, probably more, to make that work," Stewart said. The idea that stages of Earth's growth are recorded in chemistry is relatively new. Previously, researchers argued that during our planet’s formation (known as accretion) with a moon-forming impact, the proto-Earth was melted and mixed to the point that it "forgot" its growth — all the data was erased. "But now what we've learned is that data wasn’t erased, and it's exciting because now we have clues to the stages of growth," Stewart said. She added that the next step would be to calculate exactly under what impact conditions the early atmosphere actually might have been blown off. But if the early atmosphere disappeared due to an impact, how did the Earth get its atmosphere back and how did it finally evolve into the one we have today? Stewart says that after the last giant smashup that finally formed the moon, the Earth continued to form, accreting planetesimals — mountain-size space rocks that stuck to it, making it bigger. "Theseplanetesimals delivered some of Earth’s volatiles," she says, eventually bringing the atmosphere to the state it is in today. Volatiles are elements able to escape very easily. Ian Crawford of Birkberk College, University of London, who was not involved in the study, said that the theory sounded plausible "because multiple impacts are expected to happen in the context we think the solar system was put together." "It's true that each time you have a giant impact you expect a magma ocean to form. And the early planets are expected to have a transient atmosphere, so it is possible that the atmosphere would be released if the magma ocean solidified." Another researcher who did not take part in the research, Robin Canup of the Southwest Research Institute in Boulder, Colo., said Stewart's theory sounded "very interesting." But, she said, "The issue is whether we require a specific sequence of multiple impacts to form the moon. Once you do that, [you assume] that each of them probably have a somewhat small probability. When you multiply these probabilities together, you end up with a very small probability. "Then you have to ask, is this really the right solution?"